Sociologists have different opinions on how to define social structure. George C, Homans associates behaviours in daily lives, whilst talcott parsons argues that social structure is a human interaction. Another well-known sociologist, James S. Coleman, depicts social structure as a pattern of human interactions among people and groups of people. John C. Kornblum emphasises the concept of the pattern of behaviour of individuals and groups as a repeated behavioural pattern which creates relationships among individuals and groups in society. Soerjono Soekanto perceives social structure as a mutual relationship between social positions and social roles. Abdul Syani, on the other hand, defines social structure as a social order in society. There are mutual relationships between status and role within that social order, with a limited series of particular social elements, remain intact. Such status and roles refer to a certain behavioural regularity, hence, to create a society. Social structure within society forms a network that consists of principal social elements such as social groups, culture, social institutions, social stratification, power and authority. In short, it can be concluded that social structure included all the primary social elements intertwined, incorporating norms, social institutions, social groups, and social strata. 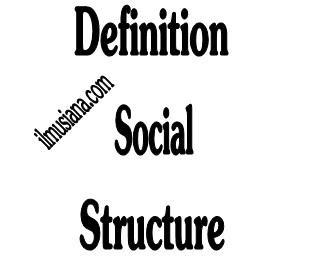 Social structure refers to primary social relationships which shape foundation of the society within which it determines the boundaries of organizational in institutions, groups and social processes. Social structure includes all kinds of social relationship among people at a particular time frame. Therefore, social structure is also known as non-process aspect of social system within which it remains static. Studies on regularity of social relationships in society rely on the concept of social structure. Social structure comprises of cultures in the society. Culture is closely linked with the degree of social strata. Thus, social structure is an aspect exists in the making of every human’s social relationship during a certain period of time. In this light, social relationships coves aspects of culture such as behavior, feeling, belief, etc. Social structure is understood as a changing stage and development of the society which can be defined of the following: first, in social structure, there is an empirical role during the process of changing and development. Second, in each of changing and development process, there is a termination stage in which stability, regularity, and sustainable social integration take place, before being “threatened” by dissatisfaction process from society. Social structure recognizes two key concepts which are status and role. Ralph Linton defines status as a series of rights and obligations, whilst role is the dynamic aspect emanates from a person’s status. Linton further categorises status into two types: an ascribed status and an achieved status. An ascribed status refers to a status which a person inherits since birth. It is given without considering abilities or a particular skill. An achieved status, on the other hands, is awarded to a person shows some good qualities. According to Soerjono Soekanto, status and role play a great role in determining the patterns of relationship between individual and society. These two concepts are the core elements of the strata system. By having a certain status, a person is endowed with a set of rights and obligations which direct his/her behaviours to act in accordance with the pattern of relationship or norm specified by the status.